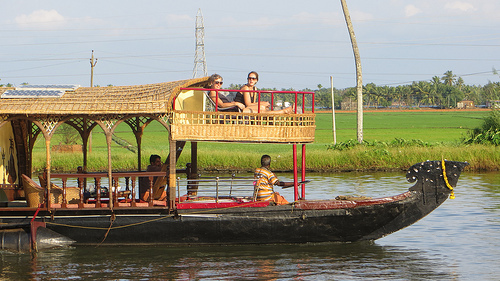 The backwaters of Kottayam are regarded as ideal for guests looking for a vacation in the lap of nature. There are lakes, canals and streams that adorn the place and add a unique charm attracting tourists in huge numbers. The popular Vembanad Lake is one of the major attractions that make the Kottayam Backwaters a must-visit travel destination. The destination is also dubbed as land of three Ls – Lakes, letters and Latex. Some of the major attractions worth a visit are St. Mary’s Church, St. Joseph’s Monastery and Ettumanoor Shiva Temple. If stunning Valiyaparamba and Chandragiri are on your list, Kasargod backwaters tour is the one you should opt for. The backwaters of Kasargod offer lovely views en route to reach the destination. Kasargod is also popular for its chain of forts. Thus, the destination is a paradise for nature lovers and individual wanting to explore the heritage richness. Valiyaparamba is a must visit attraction that wins the hearts of the visitors and also captivates the mind with the unspoilt beauty. The 30% of the Kollam Town is covered by the beautiful Ashthamudi Lake. The lake is praised as the gateway to other backwaters of Kerala. At this lake, the visitors can indulge in various activities such as boat cruise. This is one of the longest cruises from Kollam and Alappuzha, of about 8 hours. The cruise makes the guests explore some of the lovely canals, lakes, water-bound villages, and Chinese fishing nets. The list of Kerala Backwaters is so incomplete without Alleppey Backwaters. The exotic backwaters of Alleppey are praised for hosting the popular Nehru Trophy Boat Race every year. The thrill of the event and natural beauty of the place, collectively wins the heart of the visitors. Alleppey is also looked upon as an ideal romantic getaway for honeymooners. The list of attractions also includes churches, temples and charismatic landscape. The buildings of colonial past also add a unique charm to the place. The canals filled with Mauve Hyacinths also captivate the heart and mind of the guests. Backwaters of Cochin are best known for lush greenery and spectacular views. The backwater is also praised for being the finest natural harbor extended from east and south, including different small islands, naturally formed by the deposits of alluvium. On the Cochin Backwaters trip, make sure you explore the attractions such as Cheeyappara Waterfalls, Edapalli Perunnal, Chottanikkara Temple, Valara waterfalls, and Dutch Palace. Small rivulets, coconut palm trees and lagoons also adorn the destination and attract tourists in great numbers. The list of famous backwater tourist destinations in Kerala includes a lot more names like Kumarakom, Kozhikode, and Thiruvallam. KeralaBackwaters is an online travel portal where you can find numerous tour packages with various inclusions and exclusions, ensuring a memorable vacation in Kerala. Neelam Talreja is a Travel Writer with a keen interest in writing about incredible destinations. Her write-ups are detailed and comprising of all relevant details that could accommodate. All write-ups are written after thorough research with a blend of creative writing that will make you travel along. Goa has travelled a long way being a serene beach paradise due to its beautiful stretch of velvety white sands. The aroma of appetizing seafood, vibrant colors of lights and amazing nightlife are sure to create a mystical illusion and consume one’s heart. Luxury Cruises in Goa are one important factor that draws huge footfall from all parts of the world. The cruises are set to sail across various destinations starting from Mumbai, finally reaching Goa. The designing and decorations of these cruises are according to the cosmopolitan and contemporary lifestyle of people. The cruises are also equipped with all modern amenities that make it synonymous with a floating resort. There are all luxuries available to ensure a high-level of relaxation and comfort to meet then sophisticated requirements of the guests onboard. The cruises are more similar to any luxury resort and the facilities like bar and restaurant onboard ensure a wholesome experience. The guests onboard are assured of availability of comfortable accommodation along with delicious food, mocktails, cocktails, etc. For entertainment, space for indoor sports is available. Kid’s games parlor are also available for the entertainment of kids. For rejuvenation there also are massage parlor and fitness center onboard. Goa Cruises also feature casino rooms, for the entertainment of the guests and allowing them to test their luck to win a fortune. The rooms are categorized as Junior Suites, Executive Suites, and Ocean View States Room Suite to meet the specific requirements of the guests visiting Goa from all parts of the world. A private balcony is also provided in some of the exclusive rooms. The panoramic view of the blue ocean is astounding. While enjoying the cruise, you may also get lucky enough to spot some dolphins. Various recreational facilities are also available onboard that includes swimming pool, water sports such as basketball and volleyball, and many others. Some of the popular cruises of Goa are Dolphin Discovery, Santa Monica, Kadmat Island Goa Cruise, Goa Cruise, and Kochi Goa Special Cruise. Various popular destinations are covered through Goa Cruise between Mumbai and Goa. The Luxury cruises in Goa are the preferred choice of tourists as they get an opportunity to cover some of the delighted highlights in a single go.